I have been living in Oregon for 13 years now (eek! ), but I have clearly not assimilated yet because I am still no friend to the blackberry. This is partly because I dislike the grittiness of their seeds, and partly because I have spent a good portion of my summer yardwork time every single year hacking down brambles and getting stabbed. I have at least made some progress in appreciating their flavor, which isn’t necessarily as sour as I always expect. On Labor Day, my amazing Aunt Marty took us out for a fun day at the Oregon State Fair (oh, funnel cakes, how I have missed you!). When the baby started looking droopy, we dropped him off at home for a nap with his daddy, and then went back out on a wild blackberry expedition. 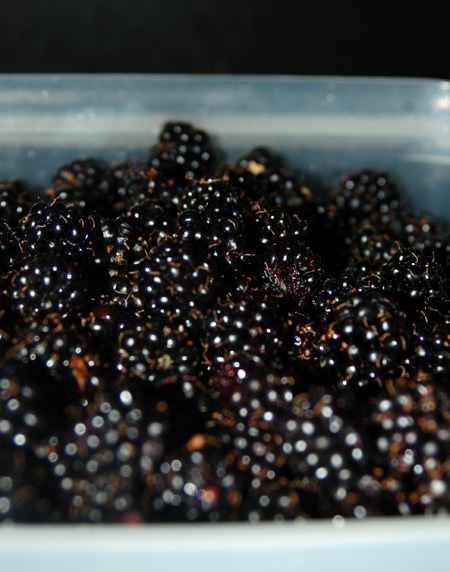 We happened across a huge bramble that didn’t seem to be on anyone’s property, stretching out for blocks along the backside of a fence, and worked our way through, filling up our containers with ripe, fragrant berries. 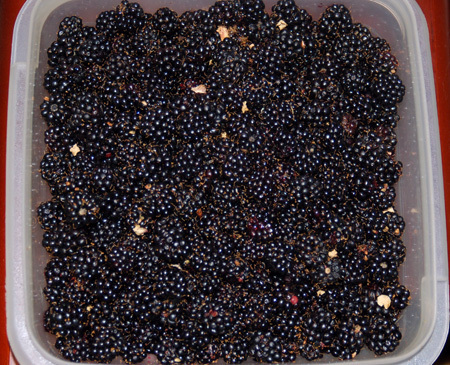 By the time we were done, our hands were stained and scratched and our pant-legs covered with prickly seed casings, but we each had a good two quarts of berries to show for our pains. It was a gorgeous day, sunny but not too hot, and berry picking seemed like the perfect way to say farewell to summer as the sun set on Labor Day. Since I can’t stand those blackberry seeds, I tried to find recipes that involved straining them out. It spoils their jewel-like appearance, but that is a sacrifice I am willing to make. 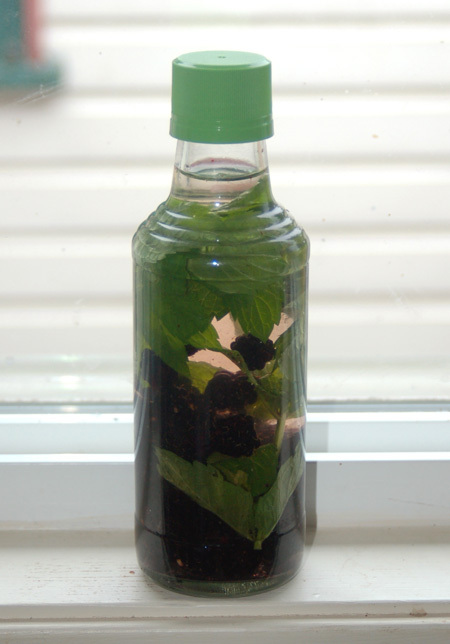 I did, however, keep some of the smaller berries whole to infuse some white wine vinegar, along with a few bright sprigs of mint from my backyard. I won’t know how it tastes for a while yet, but it should make some delicious salad dressing later on this fall. Another bottle went to blackberry syrup. I used Heidi’s recipe from 101 Cookbooks, which is a blend of blackberry puree, water and lemon juice, sugars, and an infusion of dried pepper for heat and flavor. 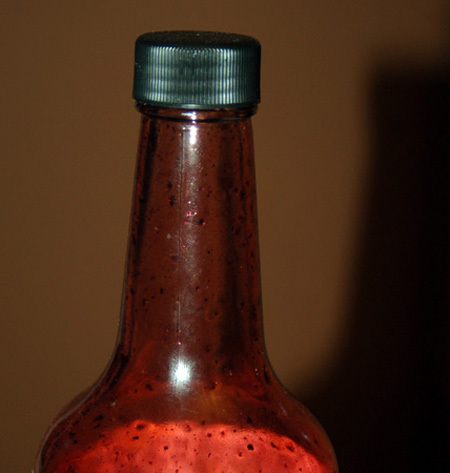 Intrigued but not very tolerant of spicy foods, I decided to use just one pasilla pepper in my syrup. Although I haven’t used it yet, my head is spinning with the possibilities. Finally, I had to attempt a blackberry version of that peach butter I made last month and stirred into practically everything we ate. For this compote, I used up 1.5 pounds of rinsed berries, 2 cups of sugar (which seemed like too much to me), a whole apple plus 8 ounces of cores and peelings (I’ve been saving these up in the freezer for their pectin), and a few other miscellany (crushed cardamom pods, some ginger peelings and a few tablespoons of leftover ground almonds). 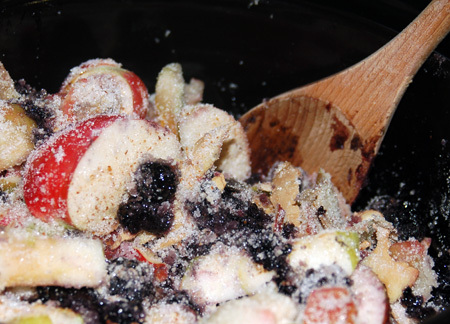 This was definitely a kitchen-sink recipe, as in “everything but.” My compote cooked all day in the crock pot, then I pushed it through the food mill that I recently discovered I still had. Its holes aren’t quite small enough to catch all the blackberry seeds, so I did a secondary sieving just to ensure a really smooth texture, and what I was left with still looked too liquidy to me. It spent about two more hours reducing at a simmer on the stovetop, but I might skip this step if I ever make this again—when I washed out the crock pot the following day, the bit that I couldn’t get out with a ladle had gelled, so I think the sugar and pectin content was more than adequate. 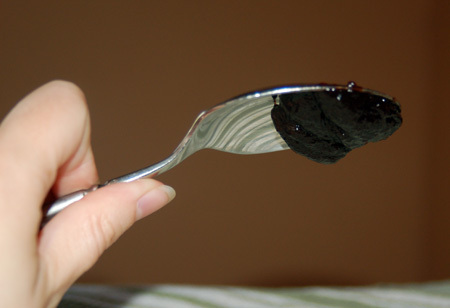 My finished product was much thicker than the peach butter, which is why I am calling it blackberry compote instead. 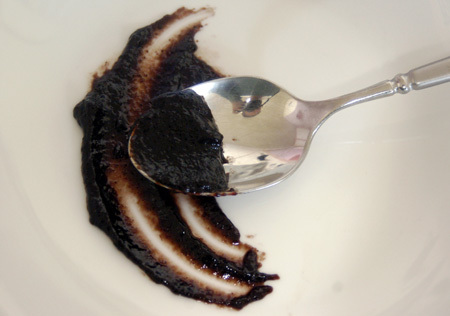 But it has a very intense blackberry flavor and is just barely spreadable, so it all works out in the end. I’ve already used it in a black bean recipe for a sweet-tart flavor, and plan to dispense it liberally in sauces (red wine or balsamic would be divine with lamb) and salad dressings, buzz it into smoothies, swirl it through yogurt, and spread it on biscuits, not to mention using it as a flavor/coloring agent in baked goods. That took care of the majority of my blackberry haul for the week, though of course you will be seeing recipes that incorporate these three condiments for months to come. I have about a cup of whole berries leftover, and if I can’t talk myself into using them in muffins or something in the next day or so, they will go in the freezer, spread out to freeze individually for future needs. This post is linked up with Simple Lives Thursday.